The 13th President of the United States is immortalized in a new coin from the US Mint known as the Millard Fillmore Presidential $1 Coin. This coin also marks the first in the series of four presidential coins due to be released in 2010. Millard Fillmore's early life was not an easy one, first working on his father's farm as a child and then becoming an indentured apprentice to a cloth maker as a teenager.This did not not stop his ambition to improve himself and he started practicing law in 1923 after studying the profession with a county judge. He entered politics a few years later and served many roles in that field before being elected Vice President of the United States under Zachary Taylor. When Taylor passed away in office, Fillmore became the 13th President. Millard Fillmore's portrait (designed by Don Everhart) is centered on the obverse. Over his head is his name "MILLARD FILLMORE" and underneath him "IN GOD WE TRUST," "13TH PRESIDENT" and "1850-1853". 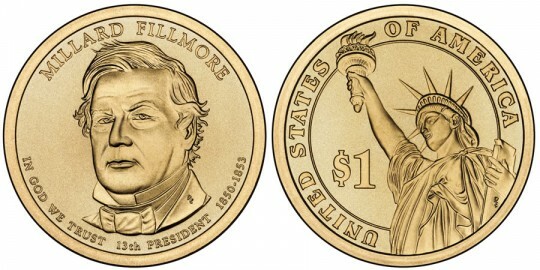 Don Everhart also designed the image of the Statue of Liberty that is featured on the reverse of the Fillmore Presidential $1 Coin. Circling the edge is "UNITED STATES OF AMERICA" and "$1" is shown to the left of the image.